How can I possibly resist sharing this recipe with you??? 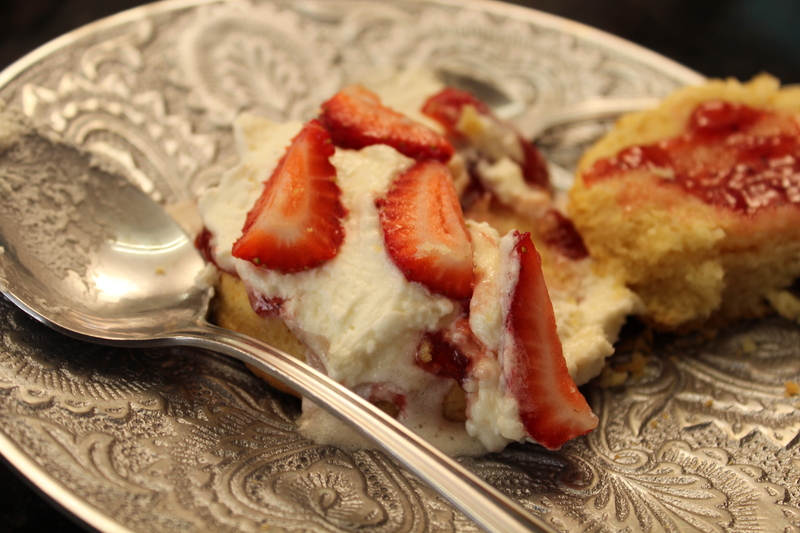 It’s another one of my decadent desserts that tempt me to indulge with wild abandon. ‘Wild abandon’ desserts is probably not what I need right now but you only live once! There is another busy day on the cards in my world…with a corset fitting in just over an hour at Arwen Garmentry in Parkhurst. 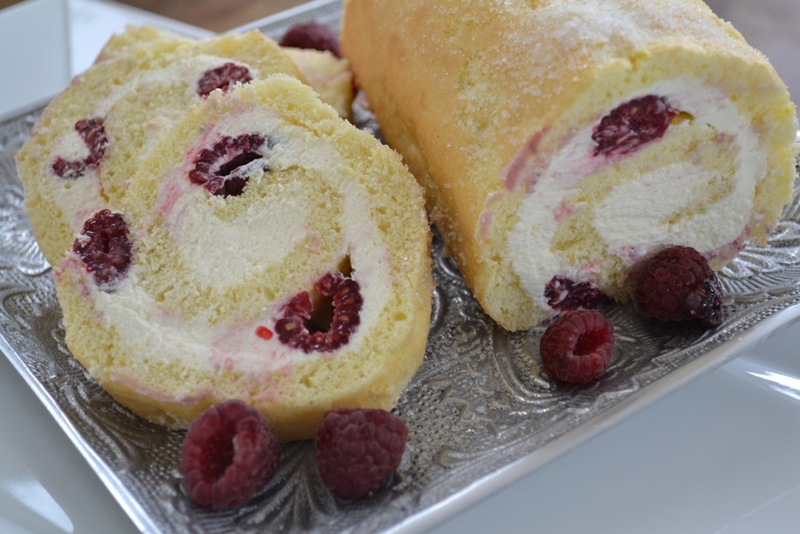 But before I head off, I am going to share the recipe and then tuck into a thick slice of luscious berry cream roll. I have to after all give the Corsetiere something to shape, pull at and lace up! Shakira’s Hips Don’t Lie track is going to go platinum today! Grease and line a swiss roll baking tin. Place the egg whites into a Kenwood mixing bowl. Whisk the egg whites and gradually add 20ml castor sugar. Place the egg yolks in a mixing bowl and whisk with a Kenwood electric beater. Gradually add the 80ml sugar while whisking continuously. When the egg yolks are light and fluffy, add the lemon zest and juice. Sift the flour, baking powder and salt into the egg yolks. Fold the mixture taking care not to over mix the batter. Lastly fold in the stiff egg whites. Use a spatula to evenly spread the batter. Bake for 10 – 12 minutes or until a skewer comes out clean when the sponge is tested. Remove the cake from the oven and turn out onto a slightly damp tea towel. Remove the baking paper and trim the edges of the sponge. Roll the sponge as quickly as possible and leave to cool. Whisk the fresh cream with sugar and vanilla essence until stiff. Unroll the sponge and spread a layer of cream over. Sprinkle the raspberries over and tightly roll the sponge up again. Dust the cake with castor sugar and serve slices with berries on the side. I celebrated Spring with my family over the weekend…beautiful sunny days are here again. And what does a spring celebration call for…a few traditional South African braais! Well, after a week of grilled meat and salad, I have just about had enough. 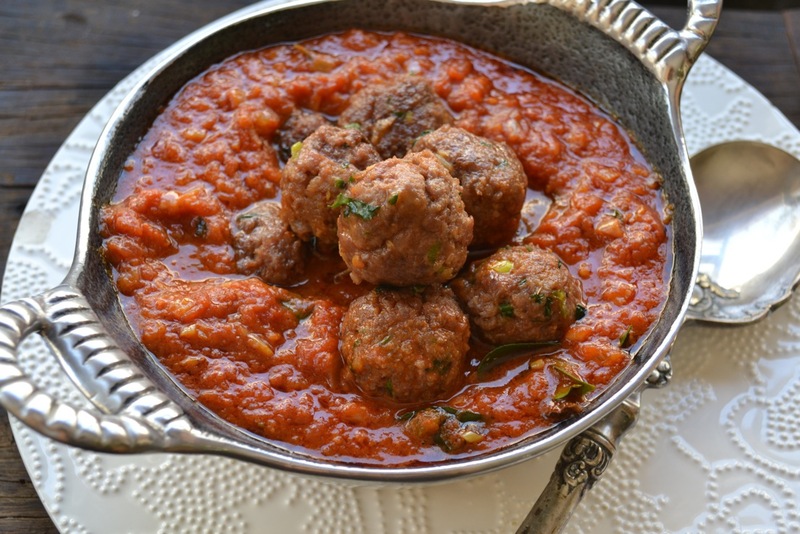 I am a spicy, saucy sort of cook and that is just what I was craving last night….a bit of spice and a lot of sauciness….I am talking about meatballs! Meatballs are called koftas in India and the home-made ones are packed with flavour. A heavy sprinkling of fresh herbs like coriander and spring onion makes them explode with sensational aromas…the hint of green chilli tempts the taste buds and gets everyone asking for more! This sauce can be served with burgers, or as a cook in sauce for eggs, fish, prawns and chicken. For a little bit of convenience you can prepare this in advance and the koftas are even tastier when they are left to marinate in the sauce for a while! If you want to tickle some taste buds, this is just the recipe for you! 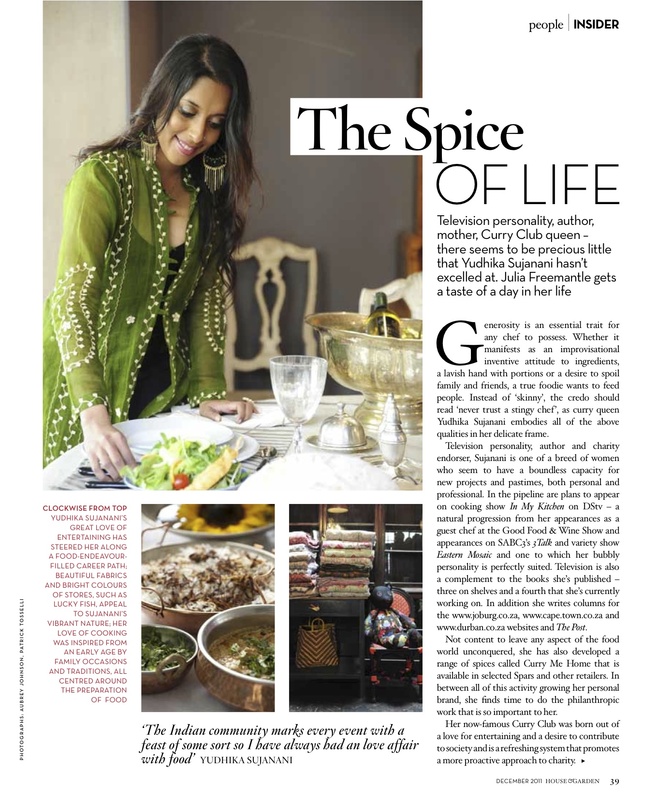 I am heading straight to the kitchen to hunt for leftovers…a little bit of kofta can go a long way! Place the lamb mince in a mixing bowl. Season the mince with salt and then add the remaining ingredients. Mix the mince well and then shape into koftas. Heat an AMC Chef’s pan on medium and pour in a little oil. Fry the koftas in batches until firm on the outside – do not fully cook them. Remove from the pan and leave the cooked koftas aside. Add the cumin seeds and when they begin to splitter, add the chopped onion. Sprinkle in the salt and saute until the onions turn a light golden brown. Add the crushed ginger, garlic and curry leaves. Add the Nan’s Lazy Day masala and stir for a few seconds. Pour in the tinned tomatoes and use a wooden spoon to break down the large pieces. Simmer until the tomatoes break down completely and the sauce thickens. Check the seasoning and sprinkle in the sugar if necessary. Add the browned koftas to the sauce and then pour in 200ml boiling water. Simmer on a low heat until the koftas are cooked through. When frying the koftas, take care not to over cook them. 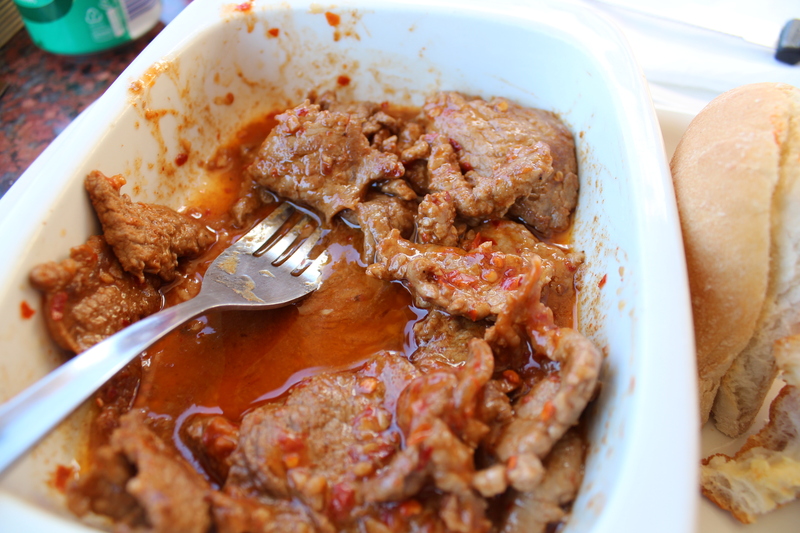 They should be firm to the touch so they do not break when simmered in the sauce. Use 6 large fresh tomatoes instead of two tins of whole peeled tomatoes. Fresh tomatoes should be grated for this recipe. This is best cooked in advance – the koftas taste better once they have been left in the sauce for a few hours. 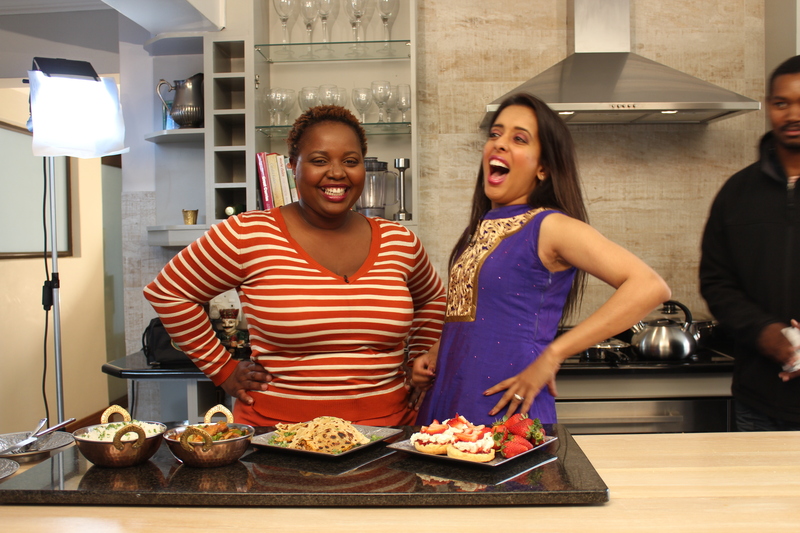 Kasi Kings and Queens….Recipes from Kasi Kitchen! 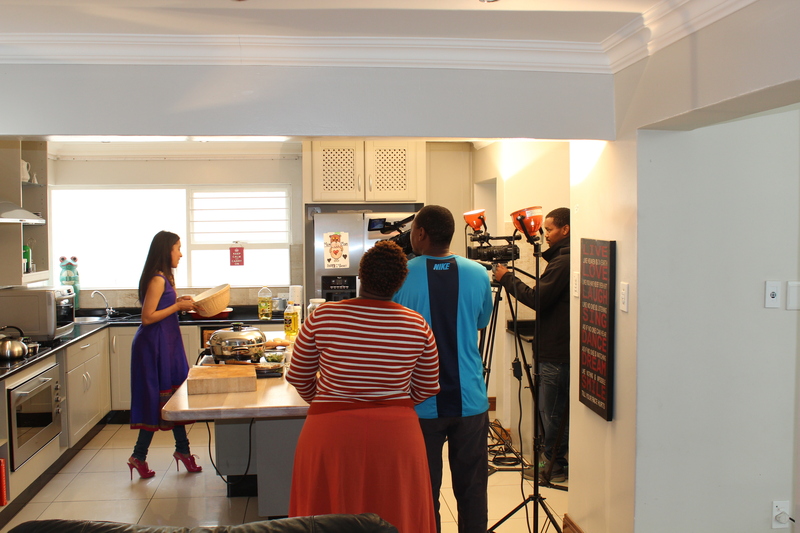 Shooting Kasi Kitchen is always fun and this time was no different! There is always a bit of drama in my life and my first shoot with the KK team was postponed due to a bout of bronchitis. The team arrived wearing their best smiles although it felt like we were shooting at midnight…bright, early and super cheerful. The star and Kasi Queen of the show, the lovely Cindy, was her usual bubbly cheerful self…looking forward to a day of fun and feasting! My troubles started when I decided on an outfit and couldn’t get into it because the zipper was stuck…any girl would be devastated and it took me a while to get my head around it. A bad omen to start the day, perhaps? 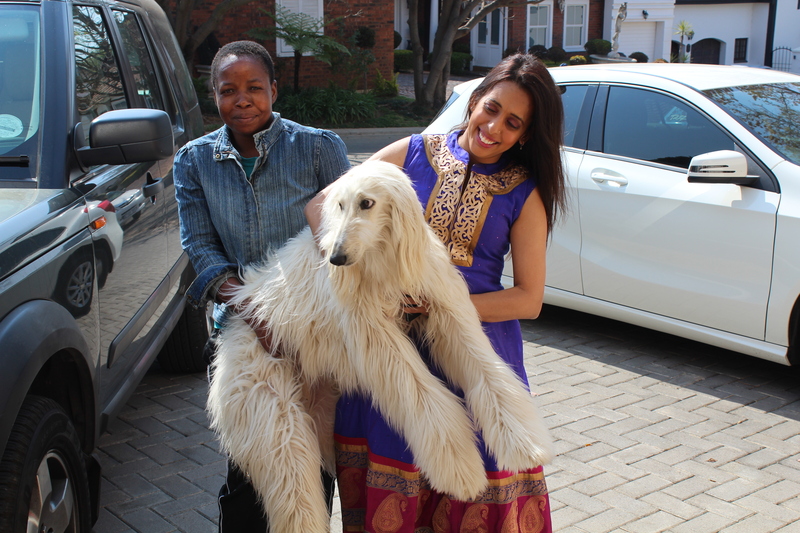 A runaway afghan hound was next…I took my heels off and dashed up the road only to realize that I had forgotten the collar and lead so we had to carry the fabulously beautiful Cleo back home. The camera crew and Cindy were terribly amused, dashed out and took pictures as we carried the beauty back home. I love my pink shoes…and tv shows, of course! Then it was the hadedas, noisy kids at home and barking dogs….curveballs have become part of the plan. Thankfully, the team were un-phased by the madness and just kept going! Rob was around during the shoot and he spotted me wearing my bright pink shoes…bad memories of a day on an island holiday popped into his head…then, me insisting that I NEEDED these shoes and there will never be a pair like these ever again! He then said he had a ‘marginal headache’ coming on…but I wasn’t going to leave without the shoes! Which shoe loving girl would leave without them behind?? You can also email me if you would like us to deliver via mail order! Add the onion and salt, then saute until the onion is light golden brown. Add the ginger and garlic – saute for three seconds taking care not to let the ingredients burn. Place the red chilli into the pot preferably on the side of the pan. Stir for a few seconds, then add the chopped chicken pieces. Saute the chicken until the meat is sealed. Sprinkle the ground cumin, coriander, garam masala and turmeric over the chicken. Stir for a few seconds and add the tomatoes. When the tomatoes soften, add the baby spinach and simmer until the spinach wilts. Sprinkle magic masala over the curry – and cook for another minute. Pour in boiling water and mix with a wooden spoon. Pour oil over the dough and mix to combine. Knead the warm dough until smooth. Roll into a large ball and keep kneading until the cracks are not visible. Roll the dough into a length and slice into twelve equal pieces. Roll each piece into a length. Curl up the half the length. Curl the other half in the opposite direction. Fold one piece over the other. Dust the pieces of dough in flour and place in a mixing bowl. Cover with a damp cloth and leave aside for an hour. Roll out each piece of dough into a round ensuring you keep the surface dusted with flour. Leave the rotis on a well floured counter. Cook the roti on a hot AMC skillet. When small bubbles and freckles appear, flip the roti over. Drizzle a little melted butter over. Turn the roti over and lightly brown on the other side. Repeat until all the rotis are cooked. Pile them on top of the other and leave to cool before storing in a cake tin lined with wax paper. The water must be boiling hot when it is added to the flour. Use a cutter to ensure that the rotis are perfectly round. 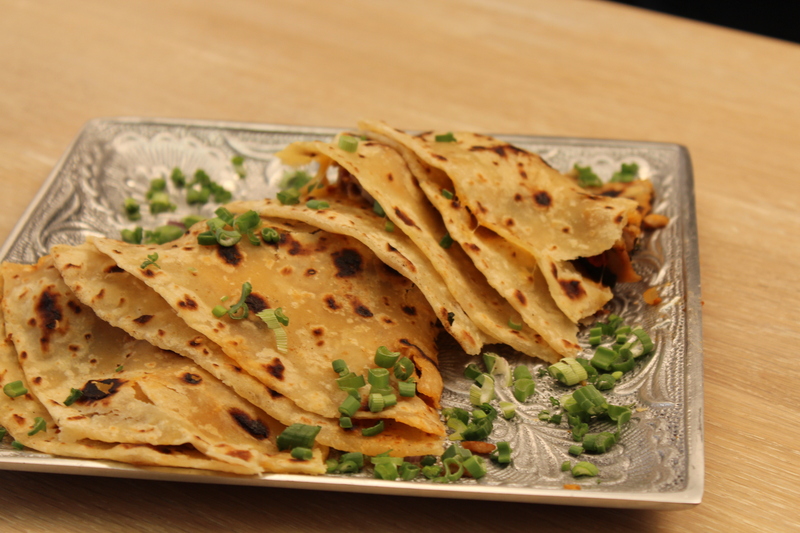 Place the chicken filling on the roti, sprinkle cheese on top of the filling, sprinkle with spring onions and then place a roti on top. Toast on an AMC skillet until the cheese has melted. Slice into wedges and serve hot! For the tasting…yum yum time! Lightly beat the eggs and cream together. Sift flour, salt and baking powder together in a large mixing bowl. Cut the butter into little blocks and add to the sifted dry ingredients. Lightly rub the butter into the flour using your fingertips. When the mixture resembles crumbs, pour in the egg and cream mixture. Gently mix the ingredients together and work into a soft dough. Do not knead the dough. The dough will be soft but not perfectly smooth. Roll the dough into a ball. Lightly flour the work surface and roll out the dough. It should be about 2cm thick. 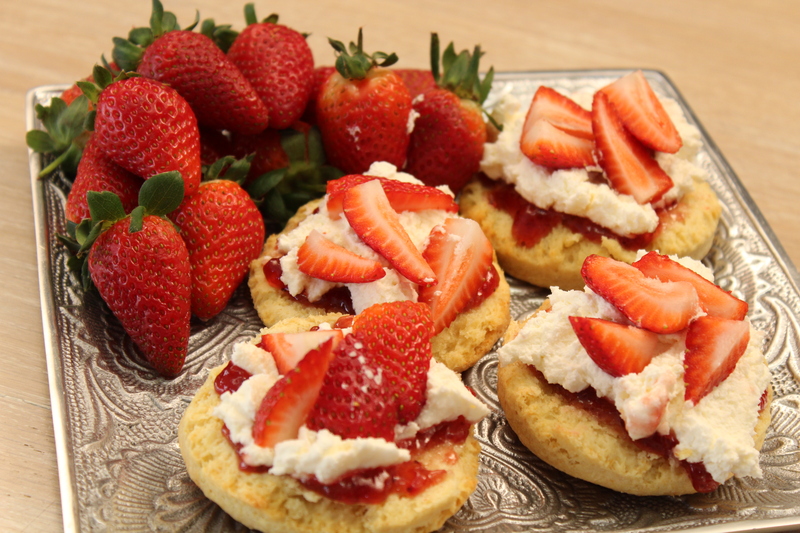 Dip the scone cutter into flour and cut out rounds. Gather the off cuts and gently knead into a ball. Repeat the process until all the dough has been used up. Place the rounds on a greased baking tray. Leave the tray in the refrigerator for 10 – 15 minutes. Beat the egg and milk together and brush the top of the scones with this egg wash.
Bake for 10 – 12 minutes or until the scones are golden brown on the top and at the bottom. Leave to cool on a wire rack. Keeping the ingredients and dough as cold is possible is the secret to making good scones. Buttermilk can be used instead of fresh cream. Try not to let the egg wash drip onto the sides of the scones as it affects the shape when baking. These scones can be frozen. Remove scones from the oven before they begin to brown. Leave to cool on a wire rack and then freeze. Defrost the scones and then bake for 4 – 5 minutes in a hot oven until golden brown and heated through. With all the madness, I always find time to shop. Sometimes, it’s even when I am not even thinking about shopping. So this is my woeful story…My shopping this time started at the Gordon Institute of Business Science. I had popped in after my marketing block with Ricardo Machado. He was fabulously entertaining…born in Cuba, raised in the States and blessed with nine lives. I left the two day session with Ricardo feeling like I could start a revolution! Back to the lust haves….I walked into Gibs to find that some of the 10000 Women delegates had set up displays of their products. And my eyes immediately fell on an Ostrich handbag….I just knew this was going to be trouble! 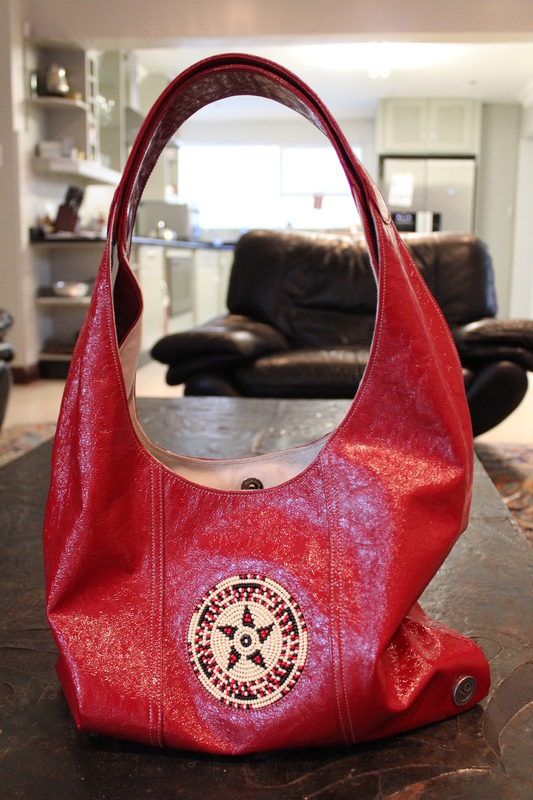 Turned out this African Queen handbag was R8000.00. I was already reeling from the previous week’s shopping and then I spotted the most fabulous red patent handbag. I wanted it and then told the assistant that I would pop back to fetch. Imagine my horror, when I returned and found another delegate coveting my find…visions of KUNG FU FIGHTING from the HEAT advert popped up in my head. My opponent was taller than me and fitter too…so I did the cowardly thing and whipped out my credit card and instructed the assistant to put the transaction through immediately! Nicola from African Queen is also part of the Goldman Sachs 10000 Women Program. Learning more about her business (I found this out on Facebook) made me feel fantastic about supporting her! One of the aims of African Queen is to support a feeding scheme – http://www.newlifecommunitycentres.co.za and also create much needed jobs. Handbags off to the African Queen Team! I do plan on visiting the store soon to view the bags and accessories…there is a Zebra print handbag that I have my eye on…and I would love to practice my shopping skills! 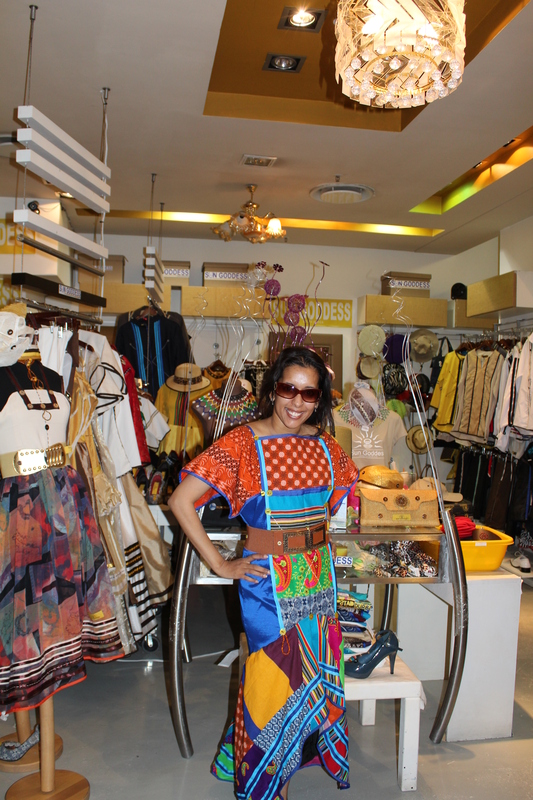 Contact details: African Queen – Shop 9, The Parks, Cnr Jan Smuts & Wells Ave, Parkwood, 2193. Next stop was Queen Street in Kensington. I roped my mom into coming along with promises of Trinchado and freshly baked Portuguese bread. But first, we needed to shop for props for my new recipe book. We headed off to ‘Ye Olde Collector’. Goodness Gracious!!! I think there is enough cutlery and crockery in this store for a few lifetimes…..Noritake, Royal Albert and Limoge….plus a hundred others that I have never heard off. Best you walk sideways in this store. There are plates, cups, saucers, ornaments, glasses and bowls everywhere! If you are shopping in Kensington…I would advise you to take your time and carry a Ventolin Pump…whether you have Asthma or not, you will surely need it. We left the store with a huge box of the antique platters, plates, bowls and some fine crystal ware too. After negotiating a good discount and then another discount after the discount…the haggling still went on a bit and when my mom started rolling her eyeballs at me, I knew it was time to wrap things up. I left the store feeling like I had done the owner a special favour by taking away at least some of his problems! The 36 buck trinchado at Euro Cafe! Next, it was Trinchado time at Euro Cafe on Queen Street. At 36 bucks a portion served with a bread roll plus a large plate of chips at R8.50…almost too good to be true but true! Now, these chips are worth a special mention….somewhere between edges and chunky chips, they are the home made sort that taste great when they are crammed into a bread roll and drowned in peri peri sauce. Two sodas and two starters, Portuguese rolls with a pretty price tag of R103.00! Oh, one more thing about Euro Cafe is they do sell those delicious red cakes that are dunked in a pinky red syrup and rolled in coconut. 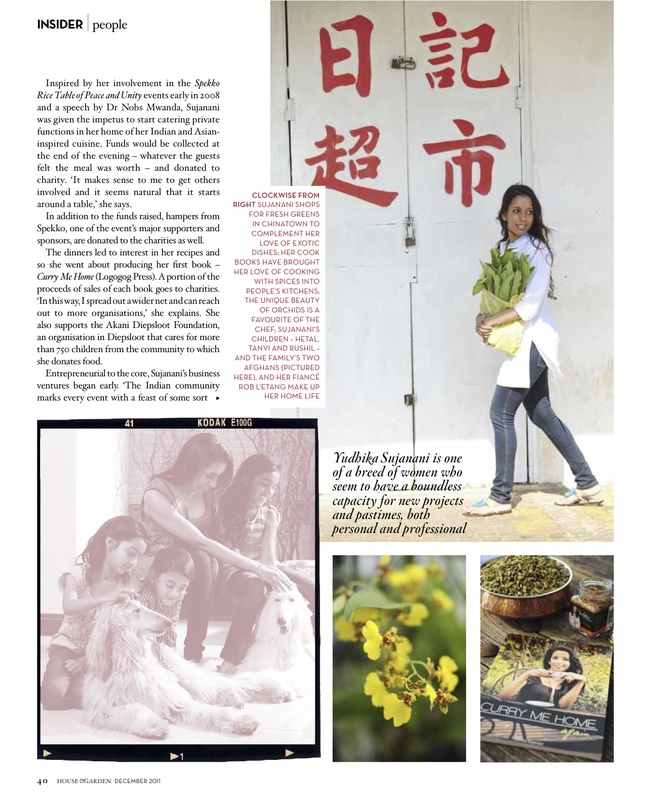 Vanya Mangaliso’s creations at Sun Goddess…Happy Spring Day! We finished off with a trip to Sandton Square for a quick whizz past the Antiques Fair. A few things that were interesting but lack of credit card facilities brought my antique shopping to an abrupt end. So, our weekend shopping ended with a stop at Vanya’s store, Sun Goddess at The Square. I think I must have tried on twenty different dresses and was coaxed into trying a few of her ‘SEE ME ON’ pieces…handbags, beaded earrings, shwe shwe (my favourite) dresses and even shoes! Shopping can be so tiring…feet up after a long day! 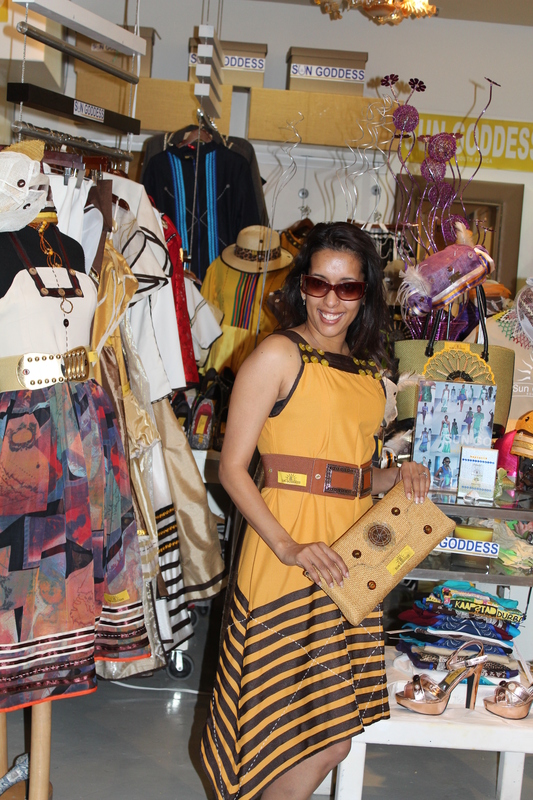 I started my ‘lust have’ shopping at African Queen and it ended at Sun Goddess…two iconic South African brands…coincidence or is it just the way shopping should be? I so so look forward to the weekend…Rob often does ask why…it’s most often frantic work days. This weekend was an action packed one! After my cooking demos at The Getaway Show, I raced off to the book store, and then raced back home to get to my piano lesson. Some days, I wonder if I am ever going to play ‘Moonlight Sonata’. I have seriously been considering taking up something like drumming that can help me de-stress! 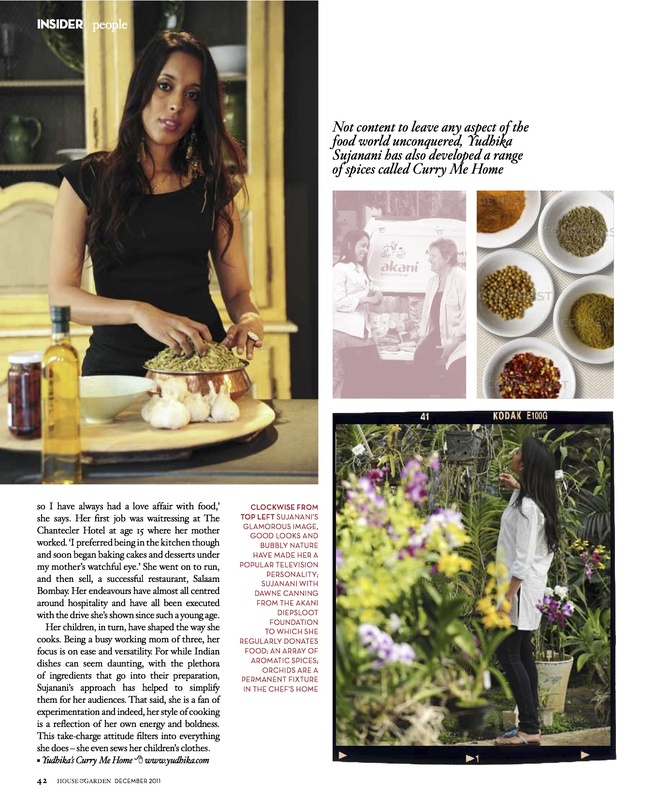 I am still on the eggless faking mission….and the faker fans out there are egging me on! This is another one of my eggless experiments and believe me…eggless or not…this is a super-duper moist chocolate cake…a triple layer whopper of a cake…so I would suggest you make it for a special eggless celebration. These cakes do sink slightly (very very slightly) in the centre once baked….don’t sweat it…the luscious frosting smooths over the bumps to give you a perfect cake. 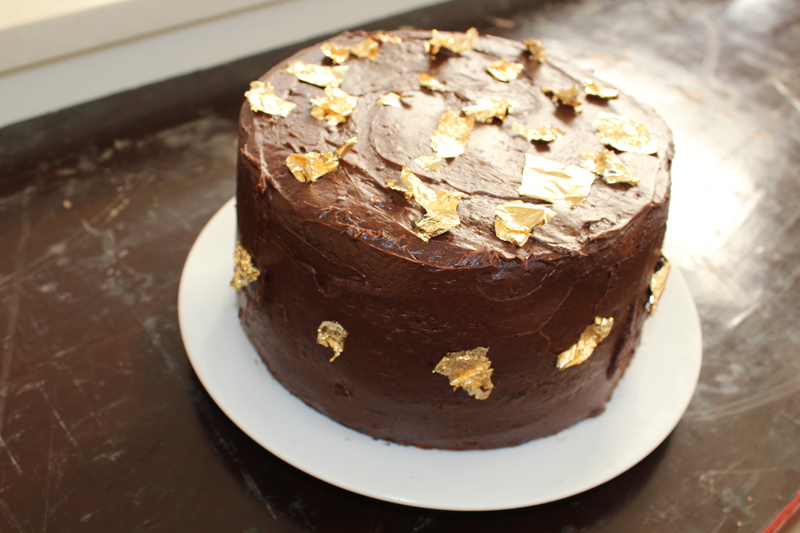 I used the fabulous Nomu cocoa powder for the frosting which results in a deliciously grown up topping. Some of the ingredients for this recipe are listed in grams so make sure you take a moment to read through it. Just one more thing…I would love to hear from you…do leave a comment and share your cooking and baking experiences with me! 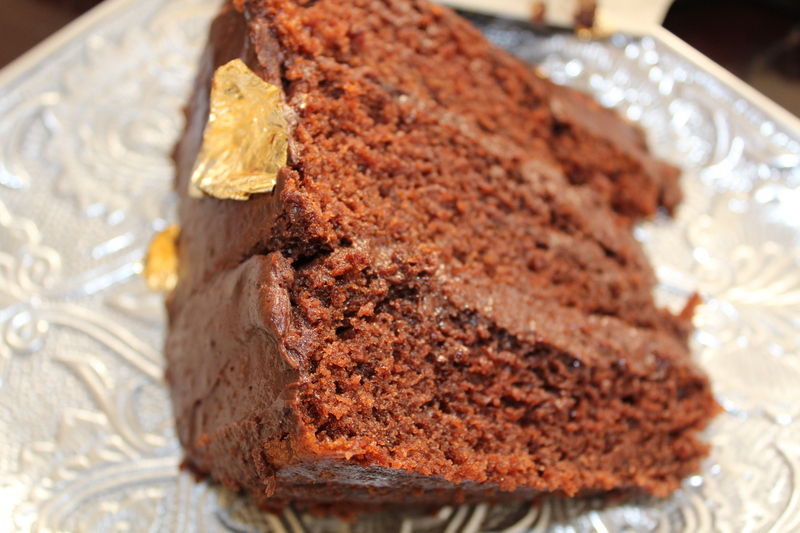 Decadent chocolate frosting on the cola cake…. Pour the condensed milk into the creamed mixture and then ‘rinse out’ the empty tins with the 60ml cold water. 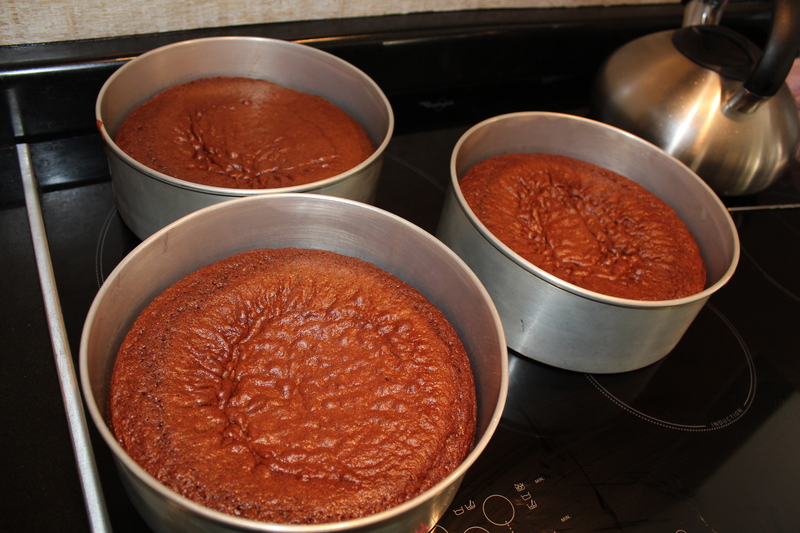 Coca Cola cakes fresh from the oven…. Frost and sandwich the cakes. Use a spatula to spread the frosting over the top and sides of the cake. 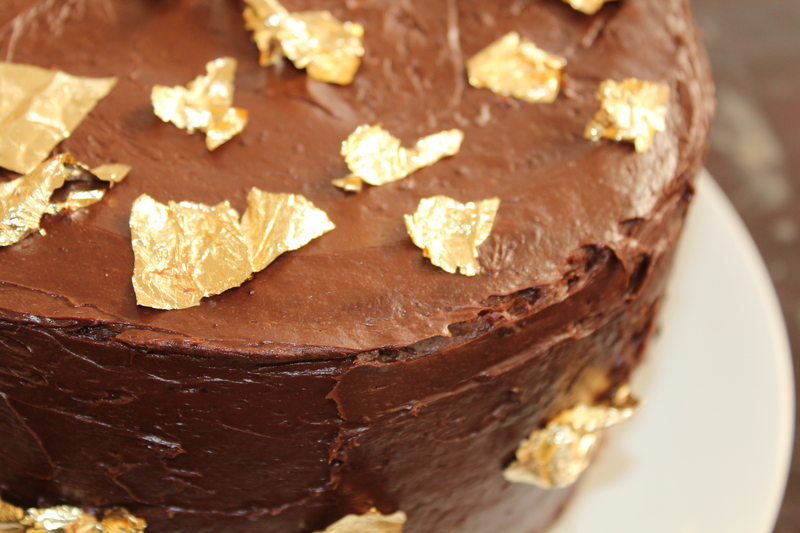 Decorate the top and sides with edible gold leaf. Slice and tuck into a large piece of heaven on a plate.